When a chill whips through the air and snowflakes chase each other to the ground, why not curl up under a warm blanket and catch an entertaining Netflix movie? The online movie supplier lists its share of holiday specials. A few Christmas favorites, like Miracle on 34th Street and Elf, seem to be missing from the list, but go ahead and grab that blanket anyway because several favorites and other enjoyable holiday features await. Following are ten Christmas movies available on Netflix, accessible for viewing this holiday season. Some prove outwardly Christian, others secular. All find their place as entertainment. Which one(s) will you choose? 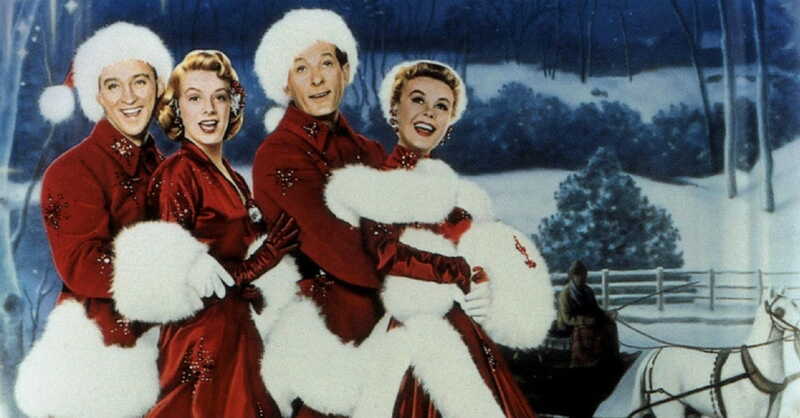 What’s not to love about this classic starring Bing Crosby, Danny Kaye, Rosemary Clooney, and Vera-Ellen? Many consider this sixty-three-year-old movie their Christmas favorite. White Christmas includes song, dance, and a good dose of oldie-but-goodie actors. Bing Crosby, anyone? Taking us back to a time of television and movie innocence, song and dance come to life in this story. Two war buddies turned performers find themselves falling for two sisters. They follow the young ladies to a failing Vermont resort owned by a familiar face – their former commanding officer. The group gives a valiant effort in hopes of helping rescue the sinking business. Watch the life of the Messiah unfold from his meager beginnings in the manger to his crucifixion on the cross and eventual resurrection. Grab some hot cocoa, a warm blanket, and this movie for a fulfilling evening of Jesus, faith, and film. What if your dad suddenly and unexpectedly morphs into Santa Claus? Just ask Charlie, a young boy dropped straight into the script of a 20+ year-old movie called The Santa Clause. He faces a trial of the Santa Claus kind in this fictional reel. The Santa Clause is a cute and entertaining movie – pure fiction for fun. Those who don’t indulge in the Santa tradition might find this film opening a door of opportunity for further discussion concerning why. Tim Allen, Judge Reinhold, and Wendy Crewson star in this holiday feature that will surely bring smiles to those watching. This family-friendly film follows the challenges of the main character, Shelby, and her family as they scramble to save their historic berry farm amid financial woes. Intertwined within the story sits a past relationship. Not only must Shelby lead the charge to save the treasured farm, but she must also navigate the waters and emotions surrounding an old flame when he resurfaces in town – not an easy task for a heart like Shelby’s. This movie whispers of the true meaning of the season, and although it may not be the strongest film of all time, consider it worth a good, clean evening of holiday movie fun. “Sometimes those who are hardest to love are the ones who need it most.” My pastor’s wife once uttered those words to me. Oh, how true the sentence rings for this tale. A sweet blue-eyed, blonde-haired girl offers her friendship and concern to Grinch, an outcast of Whoville. This causes Grinch to reconsider his revengeful shenanigans. The residents of Whoville find themselves impacted in an unexpected way. With its vivid colors, Ron Howard directs Dr. Seuss’ storybook to life on the big screen. Its heartwarming tale of love overcoming evil shines light on forgiveness replacing hurt. Although a secular movie, this feature’s theme lends itself well to the Christian walk. Grinch and the residents of Whoville are sure to bring a smile at Christmas. Although not overtly Christian, consider this one a clean chick flick worth an evening of popcorn. With a PG rating, Naughty & Nice proves to be an enjoyable movie set during the Christmas season. A cynical big-city radio personality finds himself shuffled off to a small-town Colorado station after his on-air show takes things a bit too far. In Colorado, the radio disc jockey faces the local on-air “love doctor” head-on. She’s humble. He’s not. Their face-off makes for an interesting story with an equally interesting ending. A sequel to The Santa Clause, this film follows in the steps of its predecessor well. Albeit not specifically Christian, The Santa Clause 2 offers Christmas fun for the whole family. With nearly a decade in the books as Santa, main character Scott Calvin finds himself at risk of losing Santa status if he doesn’t soon find a Mrs. Claus. Tim Allen, Spencer Breslin, and Elizabeth Mitchell star in this family-friendly piece. As if two The Santa Clause movies weren’t enough, The Santa Clause 3: The Escape Clause is available on Netflix as well. This 2006 release slides in at a “G” rating. How about adding a little kick to Christmas with this holiday special? The symmetry and flow of the Rockettes dancing somehow mesmerizes a person. And their song and dance special will certainly keep a viewer entertained. This holiday extravaganza brings Radio City straight into our living rooms. Enjoy this recording of the Rockettes from a 2007 live show. A handsome, young prince stands next in line as king of his country. A young journalist finds herself abroad, sent to report on the eligible prince. Their worlds collide in unexpected fashion. A movie of the chick flick kind, this film stars Rose McIver, Ben Lamb, and Alice Krige. Consider it a conversation piece for telling the truth versus lying, or simply sit back and enjoy the film’s entertainment. Why not toss a log onto the fire while Christmas melodies flow? No need to grab real wood, however; this film’s virtual version makes it as easy as turning on the television. Consider it the perfect backdrop to an afternoon of cookie decorating, gift-wrapping, or Christmas story reading. Call it relaxing as well. This is Fireplace and Melodies for the Holidays. Bringing a sense of peace to an often hurried time of the year, this film slows the day’s pace with instrumental Christmas tunes – many of them Christian – and the warming crackle of an on-screen fire. It includes two hours of pure calm and sweet Christmas joy. Kristi Woods, writer and speaker, is passionate about women walking deeper with God. She clicks words of encouragement at www.KristiWoods.net and is published in both Chicken Soup for the Soul: Dreams and Premonitions and Military Families as well as on Proverbs 31 Encouragement for Today. Kristi, her husband, and their three children survived a nomadic, military lifestyle, and have set roots in Oklahoma. Connect with Kristi here: Facebook, Instagram, and Pinterest.